It's finally time! 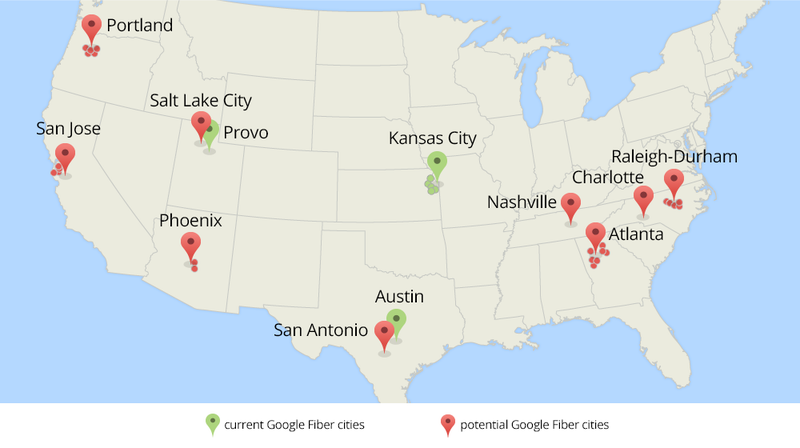 Google just announced that it's "exploring" the idea of bringing Fiber to nine more metropolitan areas across the country—34 cities in total. And based on the map Google made to show what the expansion would look like, you're in luck if you live in the South. We're going to work on a detailed study of local factors that could affect construction, like topography (e.g., hills, flood zones), housing density and the condition of local infrastructure. Meanwhile, cities will complete a checklist of items that will help them get ready for a project of this scale and speed. For example, they'll provide us with maps of existing conduit, water, gas and electricity lines so that we can plan where to place fiber. They'll also help us find ways to access existing infrastructure—like utility poles—so we don't unnecessarily dig up streets or have to put up a new pole next to an existing one. So it might come down to the utility poles? Internet this fast ain't easy. All that said, you can't help but notice the timing of Google's announcement. Just last week we learned that Comcast and Time Warner Cable hope to merge, a massive deal that would dramatically change the broadband industry. The fact that Google now wants to make Fiber go coast-to-coast makes that news a little less terrifying, since residents of at least a few more cities will have a one more (and much better) choice that TWComcast. It also bolsters Comcast's case that Google Fiber is a competitor, which may or may not have an impact on whether the deal goes through.